No African countries are on the United Nations list of contributors to fight Ebola. With few exceptions, African governments and institutions are offering only marginal support as the continent faces its most deadly threat in years. Pledges to deploy 2,000 African health workers have remained largely that - promises. The epidemic did not even figure on the agenda of a session on peace and security at the Pan-African Parliament in South Africa last week. Angry legislators from Sierra Leone and Liberia said they feel abandoned. Nkosazana Dlamini-Zuma, chairwoman of the 53-nation African Union, said this week at a meeting with the U.N. secretary-general and the World Bank president in Ethiopia that Ebola "caught us by surprise." State officials in Maine have been defeated in their effort to limit the movements of a nurse who had treated Ebola patients in Africa. Judge Charles C. LaVerdiere on Friday gave Kaci Hickox the go-ahead to go wherever she wants. The state sought to impose restrictions until Hickox's 21-day incubation period for Ebola ends on Nov. 10. LaVerdiere is requiring only daily monitoring and said she's not a threat to the public. In his ruling, the judge wrote that "people are acting out of fear and that this fear is not entirely rational." Maine Gov. Paul LePage said it's "unfortunate" that restrictions were eased, but he said the state will follow the law. Hickox called it "a good day" and said her "thoughts, prayers and gratitude" remain with those who are still battling Ebola in West Africa. Samantha Power, the U.S. envoy to the United Nations, says she is self-monitoring for Ebola like everyone else after returning from a visit to affected countries in West Africa. Power on Friday praised the United States response to the outbreak in Liberia, Sierra Leone and Guinea and called on other countries to do more. Power arrived late Thursday in New York City. She has been openly critical of the quarantine restrictions some U.S. states have struggled to put in place, adding that federal guidelines are sufficient. Power tweeted a photo of herself having her temperature taken at the airport on arrival. She also didn't hesitate to shake hands Friday. Liberia has opened one of its largest Ebola treatment centers yet in Monrovia, bracing for a new wave of infections even as officials say Liberia is making some progress in containing the outbreak. American and U.N. officials as well as Cuban doctors were among the crowd as President Ellen Johnson Sirleaf opened the treatment center on Friday. Aid is now pouring into Liberia and other West African countries hard hit by Ebola. More than 13,700 people have been sickened by the disease, nearly half of them in Liberia. The World Health Organization said this week that the rate of infection in Liberia appears to be falling but warned that the response effort must be kept up or the trend could be reversed. Ebola protocols aren't the same for soldiers and civilians returning from West Africa. The Pentagon says soldiers returning from an Ebola response mission will have to spend 21 days in isolation in a military facility. The policy depends for a returning civilian doctor or nurse who directly treated Ebola patients. The CDC recommends that only people at the highest risk - those who've had direct contact with an Ebola patient's body fluids, for example - avoid commercial travel or large public gatherings for 21 days. Anyone who develops symptoms would be hospitalized immediately. The differences are partly a function of the military's unique role, the constitutional authorities granted to individual states and the federal government's desire not to discourage health care workers from volunteering to help confront the deadly Ebola virus. New Jersey's protocol to manage patients being screened for possible Ebola includes providing financial assistance to anyone who loses income because of a state-ordered quarantine. A state Department of Health memo made public Friday represents the first time Gov. Chris Christie's administration has released full details of the state's protocols for dealing with people who have Ebola or are at risk of having it. Several news outlets, including The Associated Press, have been asking for copies of the Ebola plans since Christie and New York Gov. Andrew Cuomo announced last week measures beyond what the federal government was calling for. It took a hazmat crew 38 hours to clear out the Dallas apartment where Thomas Eric Duncan was staying before he was diagnosed Sept. 30 with Ebola. The contents were incinerated but the ashes sit in limbo in Texas nearly a month later. 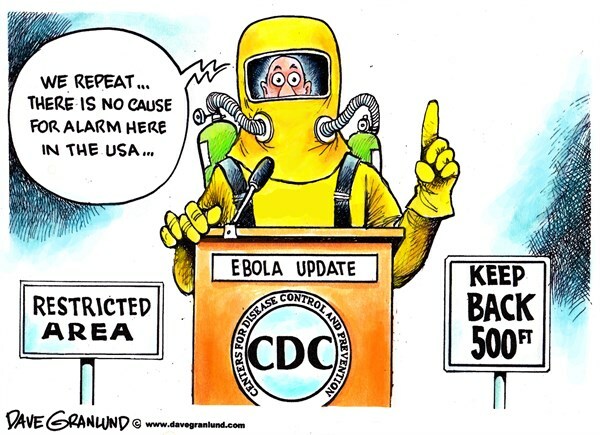 While the Centers for Disease Control and Prevention says incinerated Ebola waste poses no danger, Louisiana officials have asked a judge to block Duncan's waste from entering the state, saying they wanted to determine for themselves that it was not dangerous. A hearing is scheduled for Nov. 5.